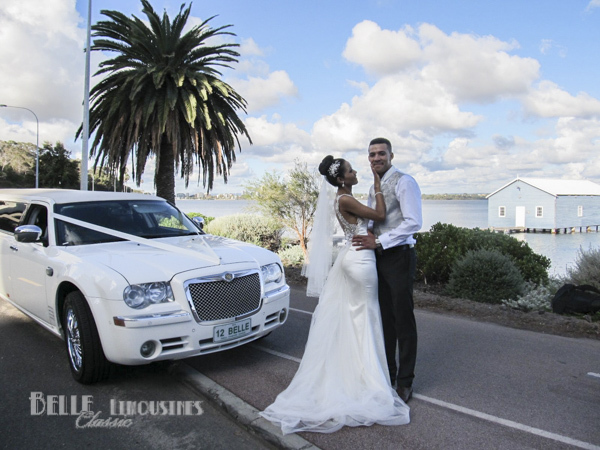 The Chrysler 300C limousine is now the ride of choice for Perth. 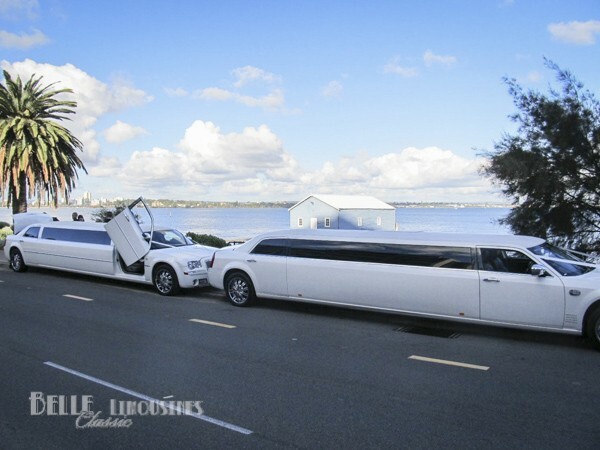 Since they first arrived in Perth during 2007 the Chrysler limos have become the most popular limousine to cruise the city streets. 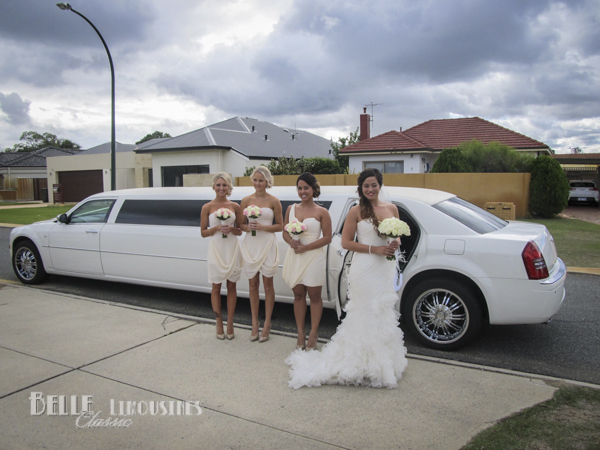 Belle Classic Limousines chose ivory Chrysler limos to complement the fleet of classic wedding cars. 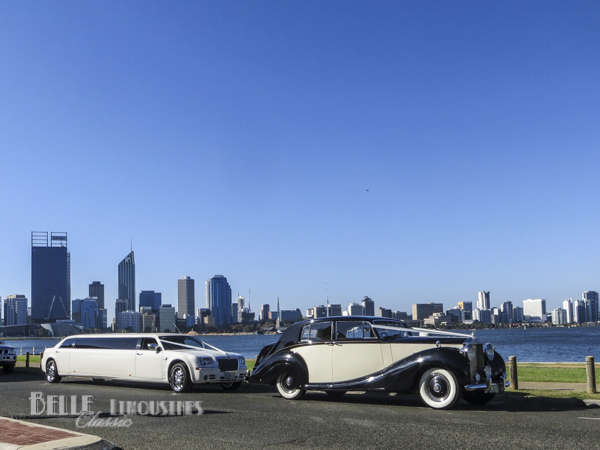 The high wheel arches, high door lines and narrow window height make the Chrysler a great match to the style lines of the 1950’s Jaguar and Rolls Royce wedding cars. The Chrysler limousines carry eleven passengers (ten passengers in the rear). Chrysler limousines have changed little over the years. 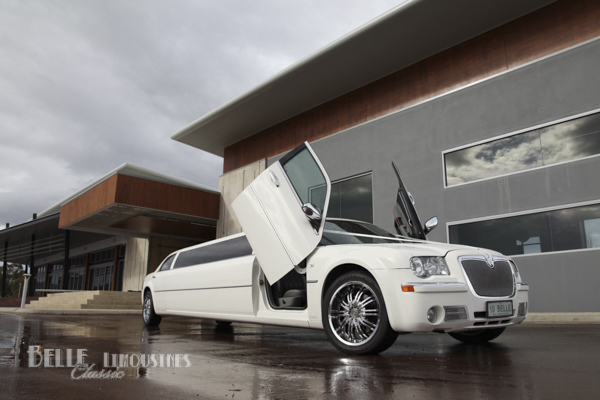 Despite a subtle style makeover in the new 2012 models, all Chrysler limos are equipped with ice boxes, champagne flutes, party and mood lighting, LCD DVD and Belle Limousines always come equipped with complementary mints and iced water. 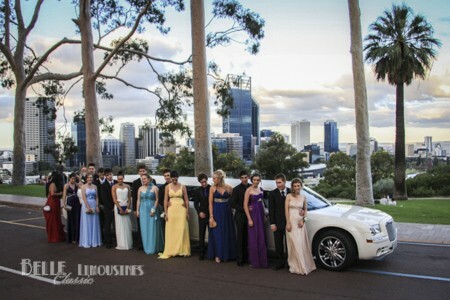 The steady increase in the numbers of stretch limousines in Perth has given a competitive edge to the hire rates of the Chrysler limos. Be assured that we will always offer the best value in town. 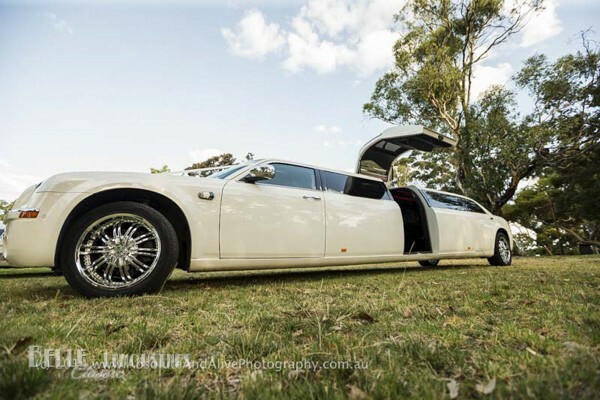 Our Lamborghini door Chrysler limousine is based on the top of the range Asanti edition Chrysler which is fitted with a superior sound system and aftermarket ‘lambo doors’ for some extra fun at photo time. 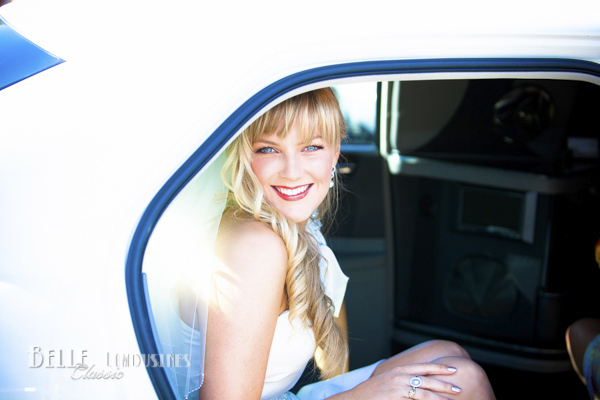 The Royal Coachworks built Chrysler limos are renowned for their spacious interior and magical fairy lighting effects which make it a popular wedding limousine. 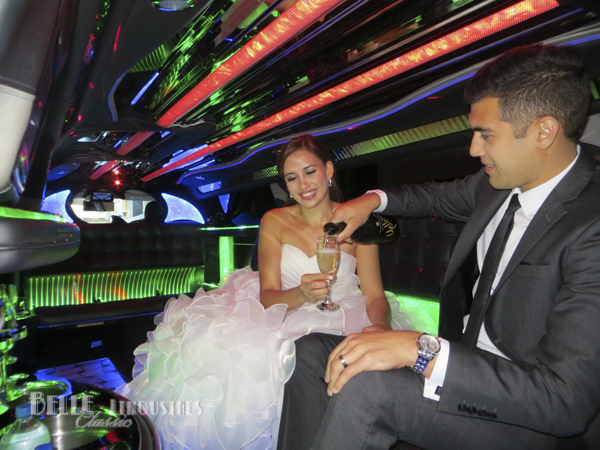 The limousine has an upgraded music system with iPod and Bluetooth connectivity for ease of operation on your wedding day or special occasion. 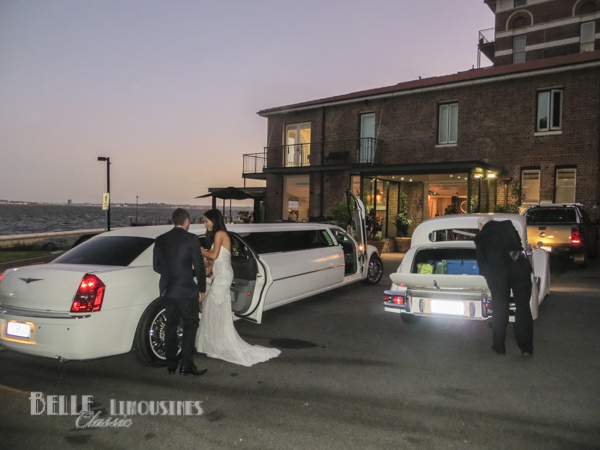 Our jet door Chrysler limousine is a Presidential Coach built limo that has the complete party light interior and the ability to access the passenger cabin via the central jet door which makes entry and exit on wedding days a breeze. The car is equipped with disco floor lighting which can also be carpeted for a more conservative look if required. The jet door limousine has an open bar with three ice buckets for easy convenient access to your refreshments whist on the road. The lighting can be switched to a single colour or ‘wedding white’ if required. 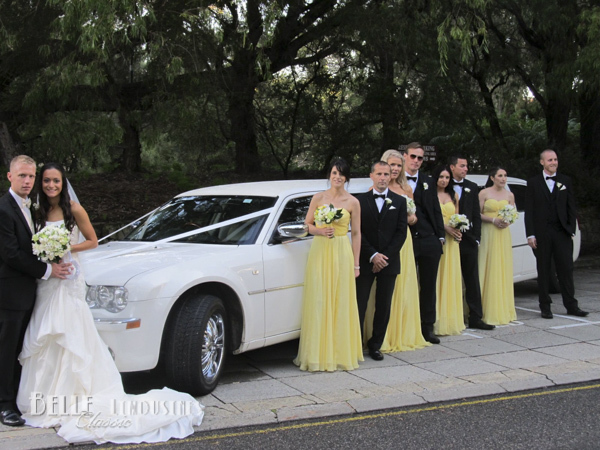 Follow the links to get specific information about how our Chrysler limos can help your special occasion. 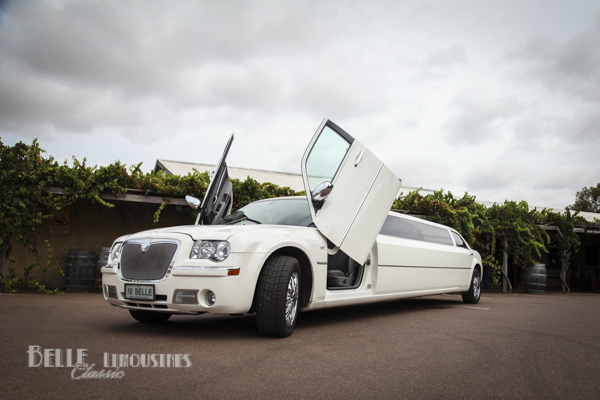 Chrysler limousines are great for getting a crowd to Perth airport BUT only have luggage capacity for 2-3 passengers. 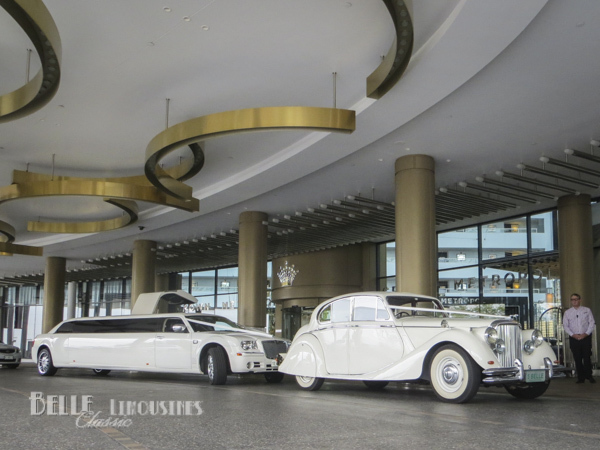 Belle Limousines offer the use of a luggage wagon for additional luggage space if your family or group of friends are heading to the airport for a holiday together. It is also popular for family members to travel to the airport to wish off a departing family member or newlyweds on their honeymoon. We can accommodate the drive to the airport, wait while you farewell the lucky travellers and return you home after they depart. Book your airport transfer. 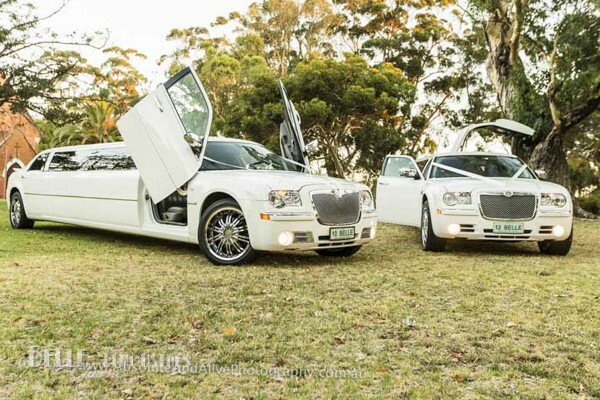 Chrysler limousines are a fun way to add some sparkle to an anniversary celebration. We have assisted many couples on their first wedding anniversary through to 60th wedding anniversaries where the family tag along for the ride to a favourite dinner destination. 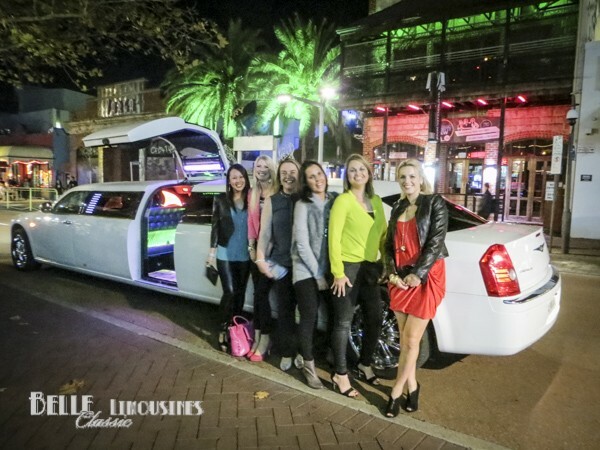 Limousines are a fun and safe way to get to and from a birthday celebration. It is common to enjoy a slow cruise with friends or family along the Swan River or Perth beaches on the way to a restaurant or nightclub. Sharing a few champagnes certainly gets the night into the right mood. We also assist with birthday cruises for younger birthday celebrations and provide complementary softdrinks or non-al bubbly as preferred. Girls know how to party! 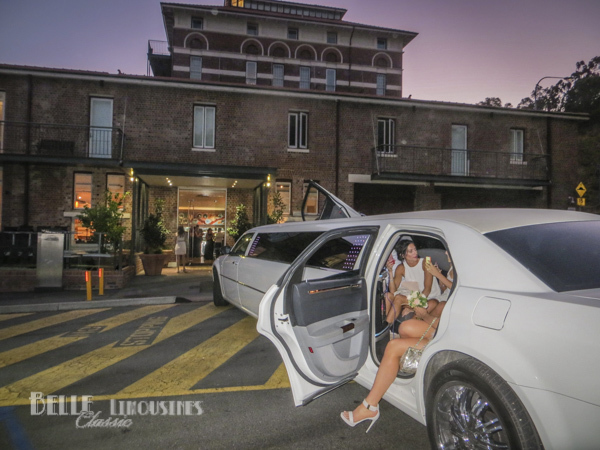 The majority of ‘good night out’ limo hire is by our female friends heading to and from a restaurant or night clubbing in the city or Crown Casino. When alcohol is concerned it is far safer to enjoy the comfort of a limousine ride to and from your event than run the danger or drink driving. 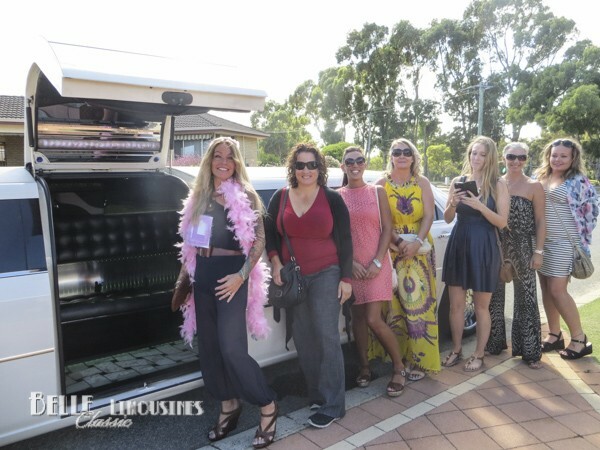 We specialise in Swan valley tours and Hen’s parties are a popular theme for wine tours in Perth. The fun of dressing to theme and spending a fun day visiting the wineries and breweries in the Swan Valley is hard to beat. 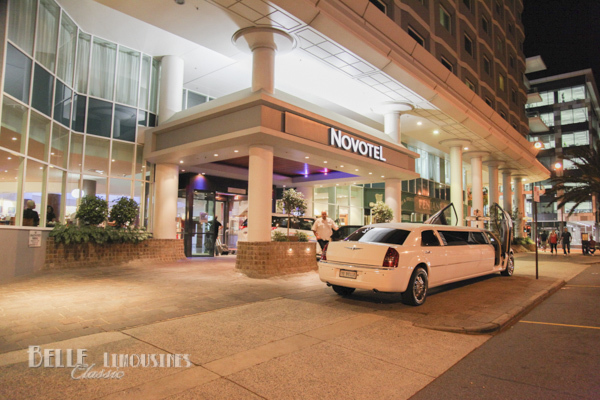 We also cater for short hire limousines for Hen’s parties heading out for a night of fun at the clubs in Perth. 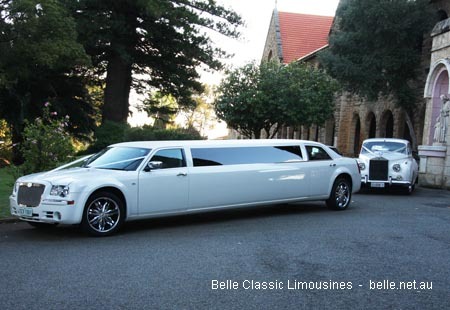 Belle Classic limousines provide our Chrysler limousines for school balls at great rates for school ball hire. With complementary soft drinks or non-alcoholic bubbly it is a fun way to get to the ball safely and back home again. 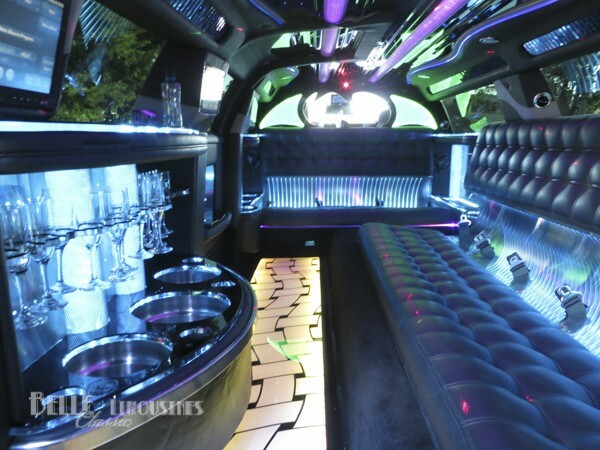 We also offer transfers to after parties by prior arrangement. 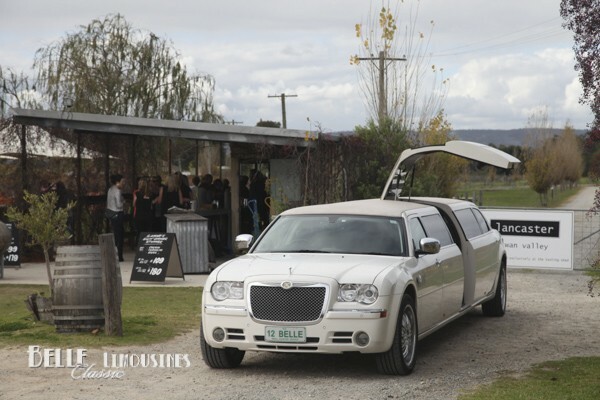 Belle Classic Limousines are the number one provider of limousine based Swan Valley wine tours. We live in the valley and personally know the owners or managers of most of the tour venues so you will get a great service on your tour. 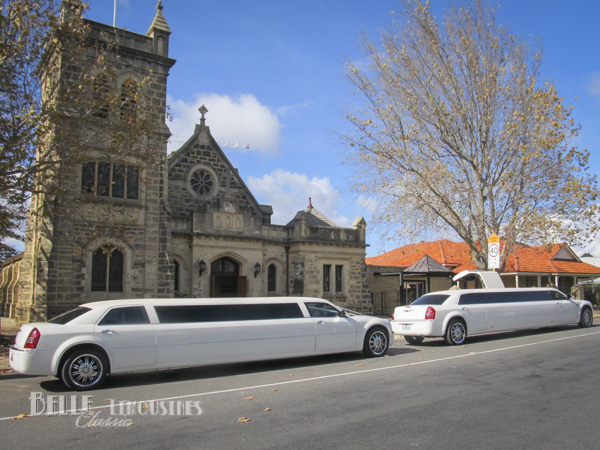 Whilst most of our wine tours are in Chrysler limousines we also offer classic car and limousine tours for couples or small groups looking for something a little special. 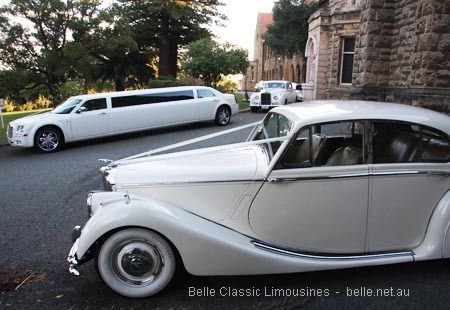 Thinking wedding transport – contact Belle Classic Limousines. 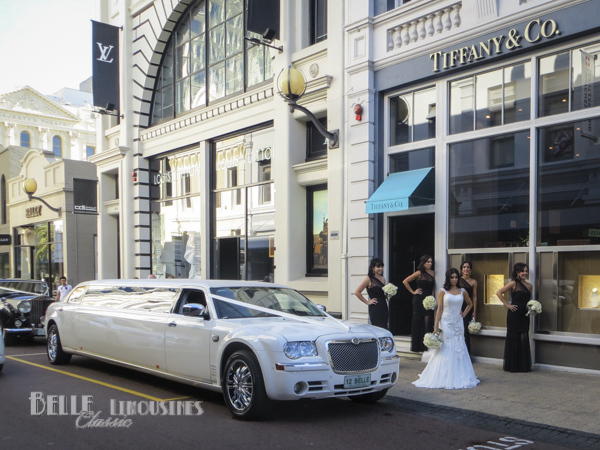 We have been the leading wedding industry transport provider for several years. It is not just about the number of limousines on offer or the size of the business, when you are looking for wedding transport choose the most experienced and recommended business over any other. We are dedicated to first class wedding transport service. Most of our wedding chauffeurs have been with us for several years, they know the venues, they know the service required and they enjoy the occasion – don’t settle for less. Click on an image to active or end the gallery.